Image Control sets its users completely free from the “dictatorship” of mouse-and-keyboard operation and huddling around a monitor in the video village or DIT cart. With Image Control you have the ability not only to “see the picture,” but to evaluate its exposure and color values—and to translate that into terms understood by everyone, novice to seasoned professional—in a handheld, portable format. Image Control is the next step in on-the-set/near-the-set image management, taking full advantage of the iPad’s touch-screen, gesture-based technology. 3cP / Image Control Pro lets you color correct, crop, and mask your images on a calibrated screen, then create a matching 3D LUT for post-production. Images can be imported from the Photo Album, camera, or via WiFi. 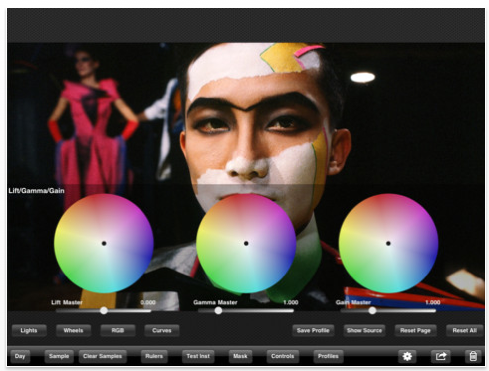 Color correction tools include printer lights, curves, color wheels, RGB controls, and a Zone System ruler. Monitoring tools include waveform monitor, vectorscope, and histogram. Image Control offers a method for cinematographers and photographers to make certain that the color and contrast of the shot is exactingly faithful to the original artistic intent, while also providing nuanced control to explore endless possibilities in expression in a manner compatible with any camera-to-post-production workflow. This app usually retails for $399.99/£299.99 but it is currently available for $199.99/£139.99 – this is a pro app. It can be downloaded here. Image Control includes a variety of new and improved tools for the entire pre-production/production/post-production workflow, including location scouting, pre-visualization, data management, and color correction, all in a device which slips easily into a script bag. Images, notes, and color correction metadata are all easily managed and communicated between production and post-production. 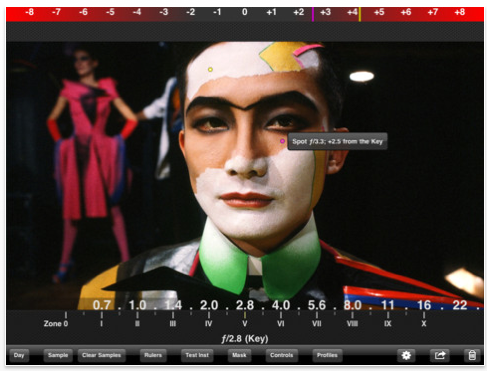 Among Image Control’s many tools is the classic 11-step Zone System made famous by photographer Ansel Adams, traditional film “printer lights” for color and density control, Photoshop-style RGB color channel curves, and the colorists familiar three-point lift/gamma/gain controls. Image Control allows cinematographers and photographers to overcome terminology differences quickly, making it easy to cross between techniques in a fast, educational, and effective way. Imagery from the built-in camera or image library or—via the 3cP on-set system—from cameras such as the Arri Alexa, RED, Sony and others can be imported into Image Control for color correction, data management, cropping, annotation, and previewing on the 3cP-calibrated screens of your iPad. Images and notes can be wirelessly exchanged between cinematographer, DIT, and director for approval of the look of the image, eliminating the need to gather around a central monitor or DIT cart. Color correction and other metadata can be emailed directly to post-production in the form of reports, 3D LUTs, or CDLs, ensuring accurately color-corrected dailies, and reducing DI costs. Along with its patented, unified system of digital camera and monitor calibration, Image Control offers unique features unavailable anywhere else in one system, all designed specifically for image making professionals including DPs, directors, VFX, DITs, and still photographers.